Layer half of the chips, half of the buffalo chicken (about ¾ cup), and half of the cheddar cheese on a baking sheet lined with parchment paper. In a small bowl, combine Greek yogurt, sour cream, ¼ cup blue cheese, salt and Worcestershire sauce. Top nacho mixture with ¼ cup blue cheese sauce. Repeat layers, finishing with the rest of the blue cheese sauce. Bake for 10-15 minutes, or until cheddar is melted. Remove from oven and sprinkle nachos with celery, green onions, and additional blue cheese crumbles, if using (or offer additional blue cheese on the side). Buffalo Chicken recipe: To make the buffalo chicken for this recipe, follow the directions for our Healthy Crock-Pot Buffalo Chicken Sandwiches, all the way through step 6 (just omitting the step of serving the mixture on buns). You'll have enough chicken to make a couple of batches of these Buffalo Chicken Nachos, with a little leftover for a sandwich the next day. Or, make just one batch of these nachos and plan on great sandwiches from the leftovers for your lunch the rest of the week. 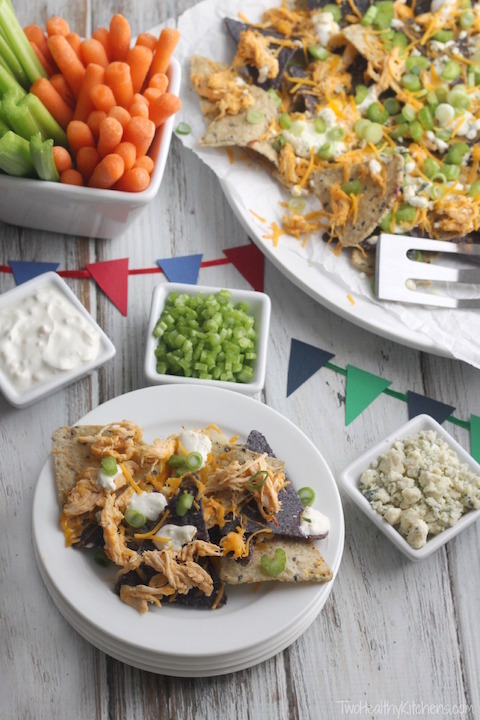 Another idea: if you're hosting a big game day party or potluck get-together, use this recipe as a two-for-one, and complete your appetizer buffet by serving these Buffalo Chicken Nachos, and then using the extra buffalo chicken to also serve yummy little Buffalo Chicken Sliders. You know we love to give you options! © 2015 Two Healthy Kitchens. All rights reserved.